A year that marks the 50th anniversary of Star Trek brings us Star Trek Beyond, the third instalment in J.J. Abrams’ new movie franchise. [dropcap]W[/dropcap]e catch up with Captain Kirk (Chris Pine) and the crew of the U.S.S. Enterprise a few years into a deep space mission, where the tolls of prolonged space travel are immediately apparent. James T. Kirk, now a year older than his father ever was, is beginning to question his purpose; his sense of adventure quelled by the monotony of daily routine. For a man always seeking to follow in his father’s footsteps, he now faces the daunting task of forging his own path. Ordered on a rescue mission that requires the Enterprise to venture into an uncharted nebula, the intrepid crew encounters a swarming enemy fleet intent on their annihilation. The devastating battle that ensues leaves the splintered crew stranded on a remote planet with all communications severed. Here they meet Krall (Idris Elba), a ruthless deviant who is against everything the United Federation of Planets stands for. He believes that unity is the Federation’s greatest weakness, and wholly intends to use this against them. The plot is fairly straightforward, but its superb execution provides the quality. By avoiding an exceedingly complex narrative, writers Simon Pegg and Doug Jung have allowed more time for vital character development. With characters that are already icons, brought to life by a brimming cast with a wealth of talent, it is essential to afford them the depth they deserve. Splitting up the Enterprise crew on an alien planet serves well to achieve this, creating interesting and revealing dynamic between unlikely pairs. The film is well structured but far from predictable, with some great twists, brilliant humour and riveting action both in outer space and on incredible landscapes. Chris Pine excels as Captain Kirk and, quite uncannily, increasingly resembles predecessor William Shatner with every film. There seems to be a natural connection between the cast members, each of whom fills their role perfectly, making for more believable performances. 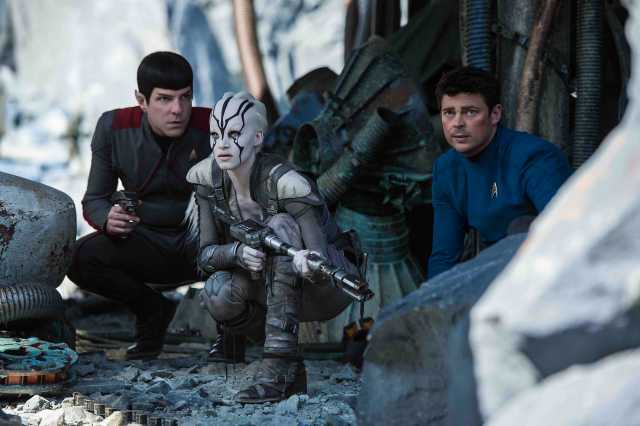 Standout performances come from Zachary Quinto as Commander Spock, Simon Pegg as Scotty and newcomer, Sofia Boutella as Jaylah, who’s character fits in effortlessly with an emotive backstory and genuine impact. Idris Elba’s formidable Krall provides a mysterious but convincing villain with solid motivations. His character is well grounded, supported by current themes with strong links to real-world issues, making the film feel all the more relevant. 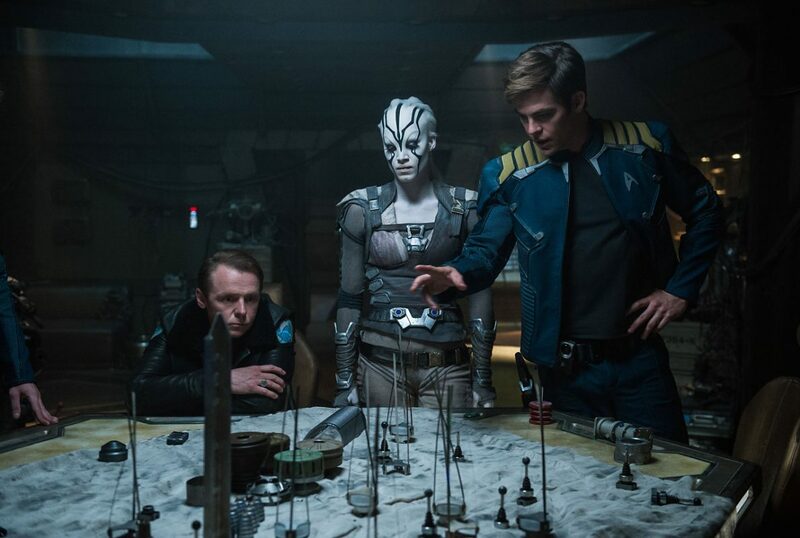 A strong sense of nostalgia is at the forefront of Star Trek Beyond, a point emphasized by the marketing material, much of which was recreated using concepts from the original series. The harmonious balance of iconic pop culture history with fresh and exciting blockbuster content is certainly a feat to be admired. The result is a visual spectacle, with vivid colour and stunning quality that delivers in every way. A touching tribute to the late Leonard Nimoy has a significant impact on Quinto’s Spock. And Pavel Chekov allows us an opportunity to appreciate the fine talent and gentle soul of Anton Yelchin, tragically taken too soon. 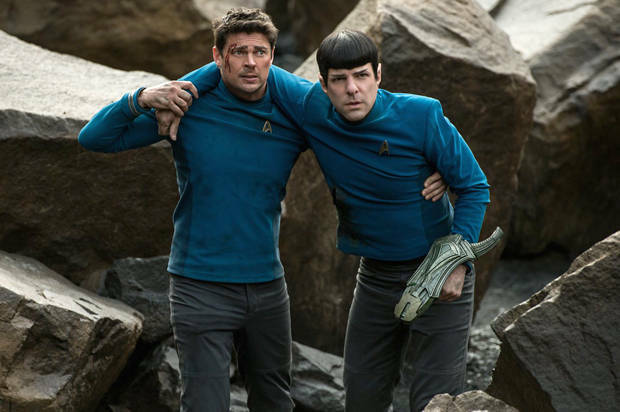 You would be hard-pressed to find many grievances with Star Trek Beyond. The only significant weak point being the second battle between the Enterprise and Krall’s swarming fleet, where it appears to be trying too hard to tap into the Guardians of the Galaxy type of current appeal but only comes across as a bit silly. Star Trek Beyond boldly goes where no man has gone before, uncovering the origins of Starfleet and leading Captain Kirk and his crew to rediscover their purpose and their thirst for adventure.